Our Cri/oFlex® CF3 product line provides multi-channel i/o. At first it is specifically aimed at supplying i/o-chains in dilution refrigerators from room-temperature to 10 mK. This product line is currently in beta-testing and development. Routing your signal, with the right noise characteristics and signal to your cold stage and achieving the lowest possible temperatures, requires careful balancing between the thermal and electrical characteristics of your cryogenic i/o chain. Cri/oFlex® is specifically designed for such environments where thermal load, microwave performance, noise characteristics, small form factor and phase stability are critical. Our in house developed Cri/oFlex® technology platform allows the fabrication of multi-layer (super)conducting circuits on substrates, which remain flexible down to the lowest temperatures and withstand countless thermal cycles. The thin (<1mm) and flexible circuits are extremely easy to install in most conventional dilution refrigerators and with a length of up to 1.2 m they can extend from Room temperature down to the mK stage. Currently we are finishing the development the first CF3 series providing a 9-line SMP version fitting any KF40/50 line-of-sight port. Different applications require varying microwave bandwidths. To meet your specific requirements we can vary the transmission of our waveguides from DC up to 20 GHz and we are working hard to extend the available bandwidth to 40 GHz and beyond. Many different type of signals are required at 10 mK, ranging from a microwave drive, to a dc-pulse, to strong microwave pump, to a dc-current, and more. Each such type of i/o chain requires a different set of passive circuitry and filtering to achieve the right specifications of the transmission and noise properties. Cri/oFlex® allows to apply on flex circuits to achieve these characteristics, and is still in development. Are you interested in being involved as a validation partner in our primary field lab, please contact us. Dilution refrigerators have very limited cooling power at 10 mK. Cri/oFlex® is optimized to minimize the thermal load on the coldest stages. From our current experiments we expect to achieve a few nW of thermal load per channel with CF3. If you are interested in more information contact us. Cryogenic quantum computing architectures create stringent requirements on i/o for Qubit control. Superconducting, spin-donor and topological Qubits all require at least one control line per Qubit. 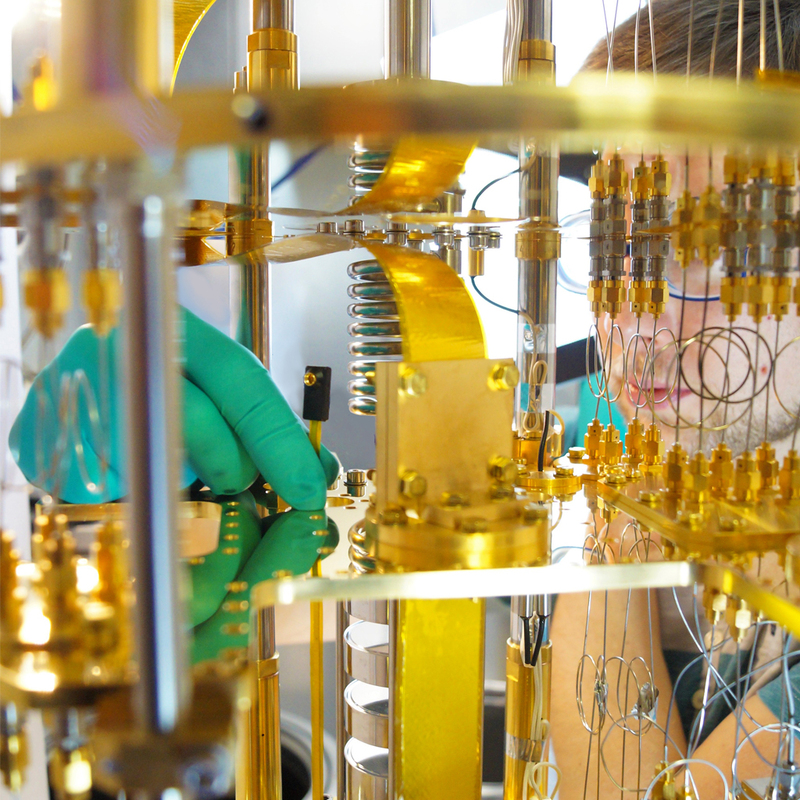 As the number of Qubits increases rapidly, highly scalable i/o with low thermal load and small volume becomes a key enabling technology for the continuous growth of Quantum Computers. 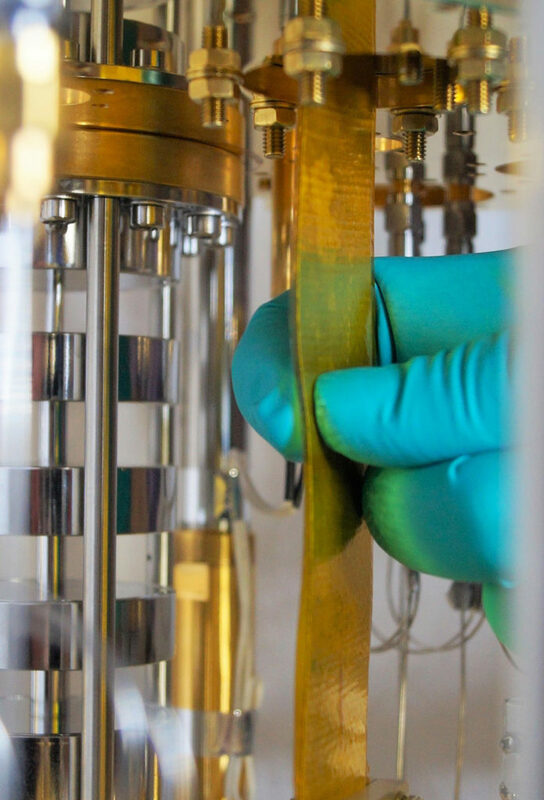 Based on Cri/oFlex® CF3 we are developing a scalable i/o platform which is optimized for the needs of the Quantum Computing industry and has the potential to increase the number of signal lines inside a dilution refrigerator to a few thousand. By using signal lines with distributed attenuation and integrating microwave signal conditioning, we almost completely eliminate the need for additional microwave components. Additionally, the small volume and low thermal load greatly increases the number of signal lines that can be installed inside a dilution refrigerator. This makes Cri/oFlex® a truly scalable technology for cryogenic i/o. Different quantum computing approaches put different requirements on attenuation and signal conditioning of the i/o chain. Therefore we are also developing on-flex microwave components. Directly integrating microwave attenuators in Cri/oFlex® will eliminate the need for separate passive components and ultimately allow the design of customized signal conditioning tailored to your specific i/o needs.